• 290 sq. 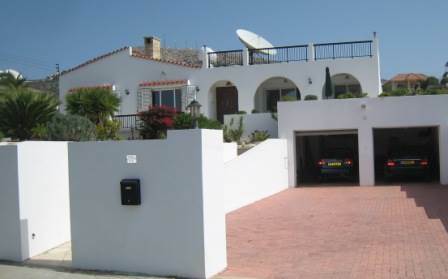 m., 4 bath, 5 bdrm bungalow "Roof Top Terrace" - €699,500 EUR - 5 Beds with Title Deeds! Tala, Paphos - Boasting a breathtaking view of the Mediterranean Sea, this bungalow is nestled on the hillside of Lofos, the best established area in the Paphos district. This one of a kind Mediterranean style home has received every possible upgrade ensuring complete comfort and luxury using the finest materials from the granite floors to the custom built Syrian stone fireplace. Roomy enough and ideal for a large family with school age children who may attend the International School which is only 10 minutes away. Within easy reach of Paphos, yet set away along the hillside, Lofos is a Tala neighbourhood that has built it's reputation on the desirable homes and views throughout and proximity to everything.